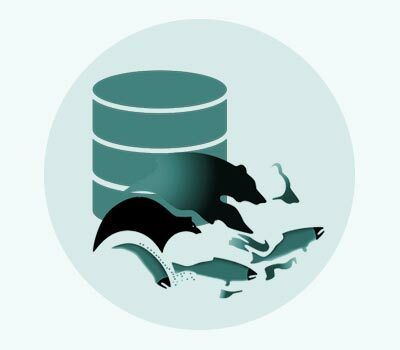 The Okanagan Nation Alliance Fisheries Department Data Portal (ONAFD) is an enterprise relational database developed in SQL Server, with an emphasis on a custom metadata standard for the Skaha Lake Experimental sockeye reintroduction program. This metadata database serves as the central storage facility for all ONAFD raw data files associated with the Skaha Lake Experimental Sockeye reintroduction program. It became clear in 2008 that there was a higher priority need to develop a more complete metadata standard and improve management of raw data files related to ongoing monitoring in the Skaha program that was being conducted by the ONA fisheries department. A new secure web-enabled data portal was created for organizing all raw data and related metadata for the Skaha Lake Experimental Sockeye Reintroduction Program. ESSA created a “keep alive” upload process for large heterogeneous file uploads, added a search feature, and a “one zip” download functionality to make it easy to obtain all attached files associated with a particular upload. In addition, we developed administrative features that enable the system administrator to add users, reset passwords, and control user access levels. A fundamental concept in the design of the Data Portal is that all raw data files that are uploaded to the system are actually stored in this database, rather than the file server. This maximizes protection against accidental deletion of files from the file server, and ensures that all files are fundamentally traceable, backed up and “go with” this SQL Server enterprise data store that includes standardized metadata tags. ESSA also continued to host the web portal application and underlying database, to enable full scale testing by ONA staff and Skaha Experimental Reintroduction Program investigators.